Ornamental Grasses are becoming extremely popular in low maintenance landscapes as a way to add beauty and color without a great deal of hard work in the garden. Another great way to implement ornamental grassesis for fall landscapes. Many ornamental grassesfor fall landscapes will last throughout the fall and winter months and will add texture and form to any fall garden design. Keep in mind that most, but not all, ornamental grasses for fall landscapes can be grown in almost any type of soil and usually until temperatures reach the low to mid 40s overnight. All of the following ornamental grasses are excellent suggestions for most average fall landscapes, but for those living in extreme conditions, it is best to research these grasses before adding them to your fall landscape design. 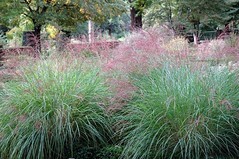 Without a doubt, Blue Oat Grass is one of the most popular ornamental grasses for fall landscapes. The large, densely blue colored foliage is attractive year round, but also provides beautiful flowers from June to August. 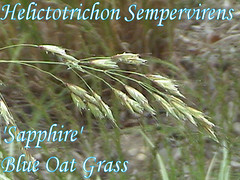 While Blue Oat Grass does well in most mild to moderate climate zones, it is also fairly drought tolerant, only needing water every 1-2 weeks. For these mild to moderate climate zones, Blue Oat Grass can also make a great wint er landscape choice as well. 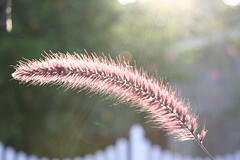 Another large ornamental grass, Fountain Grass is another favorite choice of gardeners who prefer ornamental grasses for fall landscapes. Fountain Grass produces beautiful green foliage through the year, but the grass turns a golden yellow in the fall, adding to your fall landscape. 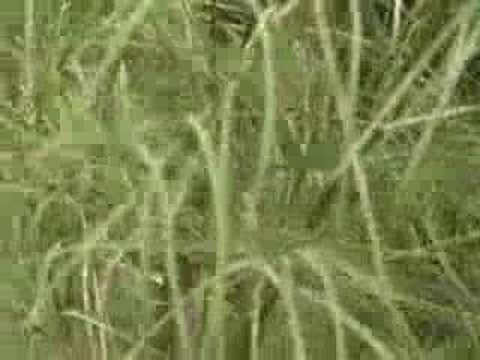 This large ornamental grass can reach anywhere from 1 to 3 feet at full maturity. Keep in mind that this is an excellent summer landscape choice as it also offers beautiful white to purple flowers that will last until early winter. A beautiful, tall prairie-like ornamental grass, the Big Bluestem can reach up to 8 feet in height, so be very careful where this ornamental grass is planted. The Big Bluestem truly is one of the perfect ornamental grasses for fall landscapes as the flowers wait until late summer or early fall to bloom and the fall foliage is also a vibrant orange color. Throughout the rest of the year, the foliage remains a bluish-green. While it does not have much presence throughout the winter months, it will begin to grow in April and become beautiful again by the early summer months. A wonderful, medium sized plant, growing 3 to 5 feet at total maturity, Feather Reed Grass is another favorite among ornamental grasses for fall landscapes. This is also a favorite year round plant that grows well in almost any climate zone, although it may grow smaller in extremely warm climate zones. Flowers will occur in the mid summer months, a white to red color and will change to a beige color in the fall and into the winter months. Keep in mind that the wonderful temperament of this plant means that it can withstand excessive watering, sun or even lots of shade. Green gardening is a method that your plant will grow a healthy and productive life by feeding off natural nutrients in your gardens soil. These nutrients are supplied by organic matter you add to your gardens so that nature can decompose it and turn it into a nutrient rich humus. This final product is what will improve your gardens soil structure and greatly benefit the plants you are growing, like your flowers, fruits, herbs and vegetables. Every fall, millions of lady bugs (or what seems like millions) swarm around my house here in west central Wisconsin, looking for a place to spend the winter. Actually, they are not “true” lady bugs. 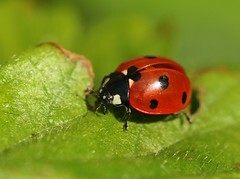 They are “Multi-Colored Asian Lady Beetles.” The beetles are beneficial to the environment because they control aphids. 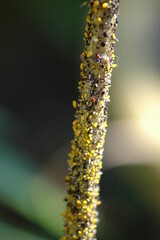 And from what I’ve read, the multicolored lady beetles are much better at controlling aphids than the ‘real’ lady bugs. 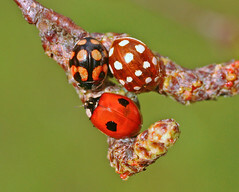 How can you tell the difference between native lady bugs and the multicolored beetles? Lady bugs are bright red. The multicolored lady beetles come in shades of orange, from light to dark. They also have many variations of patterns of spots. Some have almost no spots at all, and some have many spots. When you look closely at the multicolored lady beetles, it doesn’t seem much of a stretch to say that no two are alike. Unfortunately, on warm, sunny fall days, the swarms of lady beetles are so thick around my house that in the afternoon, I hesitate to even go outside to get the mail. The beetles land in my hair, crawl behind my glasses and work their way down the collar of my shirt. Thousands of the bugs also find ways into my walk-out basement. I have swept them up by the snow-shovel-full (literally). My basement faces south, and the insects are attracted to light-colored structures with southern, sunny exposures that are on a hillside. I’ve got hundreds of them crawling on the walls and across the ceiling. In the spring, when it warms up, the beetles emerge from their winter hiding places. Beginning in March, dozens of beetles crawl around my home office, the kitchen, the dining room, the basement and in other parts of the house, looking for a way to get outside. Multi-Colored Asian Lady Beetles are not harmful when they are inside the house, although they can be annoying if present in significant numbers. It’s a little disconcerting to pick up your coffee cup and almost swallow a beetle that has landed in your coffee or is crawling around the rim of the cup. And two or three lady beetles landing in your bowl of soup can definitely make you lose you appetite. If you have company coming, you also don’t want guests to find lady beetles in their food or beverages. Although the beetles are not necessarily harmful if they’re inside the house, when they swarm in the fall, they can create problems if they crawl into furnace vent pipes and plug them up. I have heard of them plugging attic vents, as well. And one woman reported to my husband (he is an Internet technician), that a lady bug crawled inside of her computer and shorted it out. When the beetles are present in large numbers, you can also smell them. The odor is a little like burned rubber or hot asphalt. When the beetles are threatened, the odor is particularly strong. They apparently view being swept off the walls (or vacuumed off) as a threatening situation. Sometimes when threatened, the beetles ooze an orange liquid, as well. I have read that the liquid can stain walls and fabrics, although I have not yet seen any evidence of that around my own house. • Vacuum up the beetles with the vacuum cleaner attachment. This may be somewhat time-consuming but it is a non-toxic and safe method to remove the bugs. 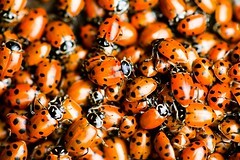 As far as I’m concerned, time-consuming doesn’t seem so important when thousands of lady beetles are invading my house. When vacuuming up large numbers of Multi-Colored Asian Lady Beetles, be sure that you don’t leave the attachment hose draped across the vacuum cleaner in preparation for the next vacuuming session, otherwise the beetles will soon find their way out of the vacuum bag and will be crawling around the house again. One woman from my hometown says she solves this problem by stuffing a paper towel into the end of the vacuum hose. • Seal up cracks or spaces around doors and windows, if possible. Sealing up cracks and spaces will make it more difficult for the beetles to get into the house in the first place. The beetles do not need much space to crawl through. Even a door that fits the frame quite well may still leave enough space to allow the beetles access to your house. • Spray around door frames and window frames with a bug spray containing pyrethrins or permethrin. I have discovered that the beetles will avoid crawling across bug spray with pyrethrins or permethrin, or if they do crawl across it, they die in a short while. I don’t particularly like to spray bug spray inside my house, but when it’s a matter of spraying or letting thousands of lady bugs into the house, spraying seems like the lesser of the two evils. I don’t like killing the beetles, either, and would just as soon “live and let live,” but I draw the line at a house-full of beetles. • Use the garden hose to spray the beetles off the side of the house. In the fall, when the beetles are crawling on the outside of my house by the hundreds of thousands (sometimes it’s almost difficult to see what color the house is because there are so many beetles), I take the garden hose and use the sprayer attachment to spray them off the side of the house. To make an impact, this must be done two or three times a day on days when the swarms are active. I have also used an attachment for the garden hose that allows me to spray a soap-and-water mixture on the house. I haven’t noticed that a soap solution is really any more effective at knocking the beetles off the house, although the exterior walls are cleaner when I’m finished! • Learn to tolerate the Multi-Colored Asian Lady Beetles. I keep telling myself that the Multi-Colored Asian Lady Beetles are swarming around my house because they are only trying to survive the winter — just like all living things try to survive. Alright people! 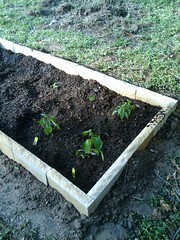 I’m not going to tip-toe around this important garden issue. Spring is coming and it’s time to start planning ahead for the weeds that are coming with it. The invasive ones are my biggest concern. 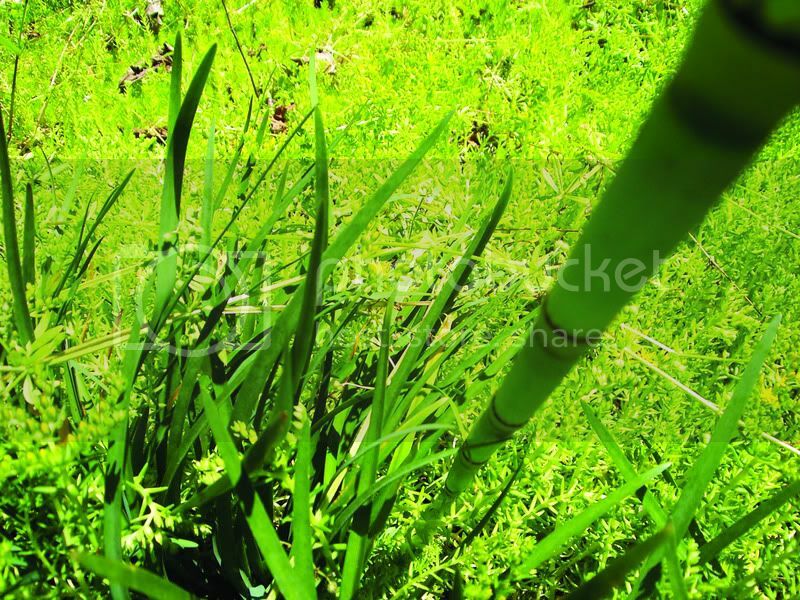 And this spring I want you all to keep an eye out for HORSETAIL (Equisetum arvense). Well, if that is the case you may now unfortunately have it, and you probably want to get rid of it…LOL! Good luck with that! All I can recommend based on asking other gardeners, and from personal experience fighting it in the garden is to: MULCH it, WEED it and SPRAY it with Round UP. Well, enough said for the moment. GartenGrl out. 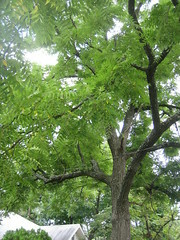 Photo by cizauskasA few years ago I lived in an old victorian house in Ann Arbor, Michigan that had a handful of stately old 100 foot tall Walnut trees (juglans regia). I quickly discovered that there were a number of plants that simply died or started to die as soon as I planted them under that tree – petunias, peonies, roses, impatiens to name just an unfortunate few. 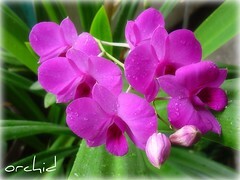 I was beginning to think perhaps I was not as good a gardener as I thought myself to be. Systems that provide proper ventilation for indoor gardens are key to indoor growing success. Without an abundant supply of fresh air such as your plants would receive in a natural, outdoor environment, your efforts at indoor gardening will soon end in an unpleasant, mini-ecological disaster. In this article, we will discuss some of the reasons why ventilation for indoor gardens is needed, as well as some different options. As you know, in the natural world, air is virtually always in motion – even on days when the air is “still;” there is almost always a slight breeze due to minor temperature fluctuations over various terrain. When it comes to indoor growing, such grow room ventilation systems are necessary in order to replicated this natural environmental condition. These consists of mechanical devices, such as “squirrel fans” or other air-moving devices, which circulates the air from one side of the indoor growing area to the other. The amount of ventilation for indoor gardens that you will need is dependent on several factors, including the size of the space in terms of cubic feet, how much of the space is used for indoor gardening, and the time of year. Normally, the rate of air exchange is greater during the summer. A solitary single-speed fan will usually not be adequate for most indoor growing needs. You can determine this by multiplying the floor area by the height of the room; therefore, an indoor gardening room measuring 10’x 20’ in floor area times 10’ in height will need enough fan and ventilation capacity to completely refresh 2,000 cubic feet of air at least once per minute during the summer, and once every three minutes during the winter. “Squirrel fans” and “Squirrel cage blowers” are technically known as shaded pole blowers. These are used in many applications in which heat build-up is a potential problem, such as HVAC systems and automotive climate control as well as high-end computers. They are constructed of two large rings, which are connected by as many as fifty diagonal blades; the entire assembly spins on its radius, drawing air in axially and exiting through a side opening. These are some of the most efficient fans available for grow room ventilation systems. Several companies manufacture what are known as “whisper fans,” which are particularly quiet-running. They tend to cost a bit extra, but if noise is a concern for you, these may provide the best ventilation for indoor gardens. Susan Slobac covers the basics of hydroponics and indoor gardening including ventilation for growing indoors. Learn about squirrel cage fans, whisper fans and other grow room ventilation systems. 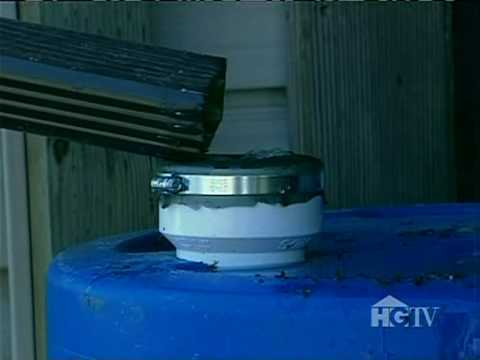 This is a great video from HGTV that takes you step by step on constructing a rain barrel. Rain barrels are a great way to use water wisely by watering your garden with free water collected from your roof instead of using the cold water from the hose.